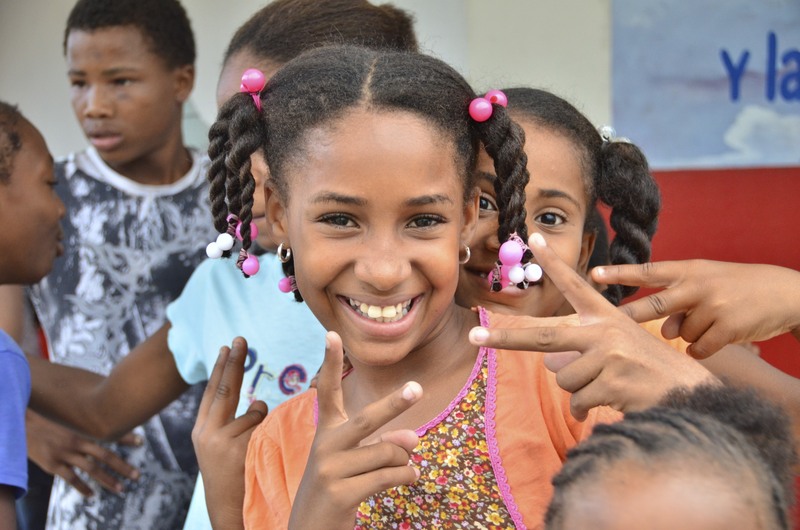 Last year I was deeply impacted by the amount of poverty I saw, and it left me feeling like I wanted to make a difference in the lives of the kids in the DR. God prompted me to sponsor a child through Compassion. After I returned home from the trip last year, I just collected all the brochures, magazines, emails, and media that Compassion sends you after becoming a sponsor, but I hadn’t really grasped the significance of what my money was being used for. I knew how important letters meant to the sponsored kids after last year’s visits and stories. But God knew that I needed a reminder of just how important all this was in the life of each of those kids. After almost a year of sponsoring Daniel Borges, I got to do something that only 1% of all sponsors get to do – visit my sponsor child face to face. I can’t even begin to describe the joy of that moment when I first saw him. 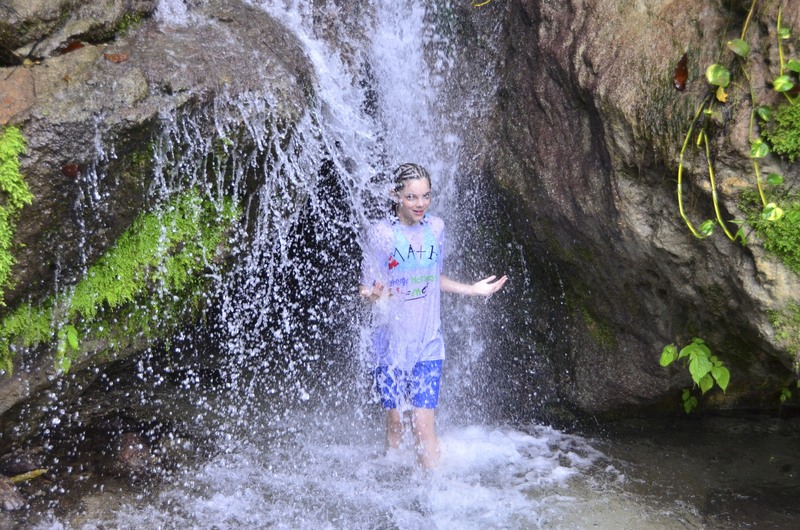 I was able to see him for two of the days while we were in Barahona which was amazing. During those two days I spent with him, I saw joy in its purest form. On the first day with my sponsor child, I asked Ryan if I could present to him his bag of gifts. Ryan said to wait until there weren’t so many kids around, but I could present to him one “icebreaker” gift of my choice. I chose to give him the green Frisbee ring flyer so that we could play and spend some time doing something together. I have never seen anyone play with a Frisbee so happily. Daniel is not a part of DR-800, the project where we were serving. He lives in Barahona, but he is from project DR-455. In order to be there at the project to see me, he had to be driven across town on a moped by his tutor, Carlos. Carlos could not stop thanking me for changing Daniel’s life and kept telling me that he would be praying for me and my family to keep strong in the Lord. I was taken aback. How often have I prayed for my child? Carlos just met me and here he is ready and committed to praying for me daily. This year I got to see firsthand how that connection between the sponsor and the child is WAY more than just that $38 check every month. I have now committed to writing Daniel frequently and praying for him daily. No longer will I look at that $38 check the same way. The sponsorship is not only something that gives him food and clothing, which are all worldly comforts and easily bought with a few bucks. It is an ongoing relationship that gives him eternal hope, love, and most importantly, Christ. Over 13 years ago, when I was in college at Christian Heritage I played on an amazing basketball team. Each of us bought in to Coach Wilmore’s vision of how we should win games (defend, block out, rebound, run the floor and execute our offense). Each of us brought something different to the court when we played. Each of us was aware of our teammate’s strengths and weaknesses. And each of us knew how to work together with our strengths and weaknesses to win the game. We trusted each other so that no matter which 5 players were on the court at a given time, we knew we could get the job done. Coach also told us, “If you get tired and need a rest, just raise your hand. I’ll get you out of the game and when you’re ready, let me know and I’ll get you back in.” Turns out, we won a national championship! It was an awesome feeling! All our hard work, all our dedication paid off! There’s no way I could possibly describe the feeling of that moment when the final buzzer went off and we threw our arms up in the air, hugged each other and celebrated! I never thought I’d ever have an experience like it…but I’ve been wrong before! 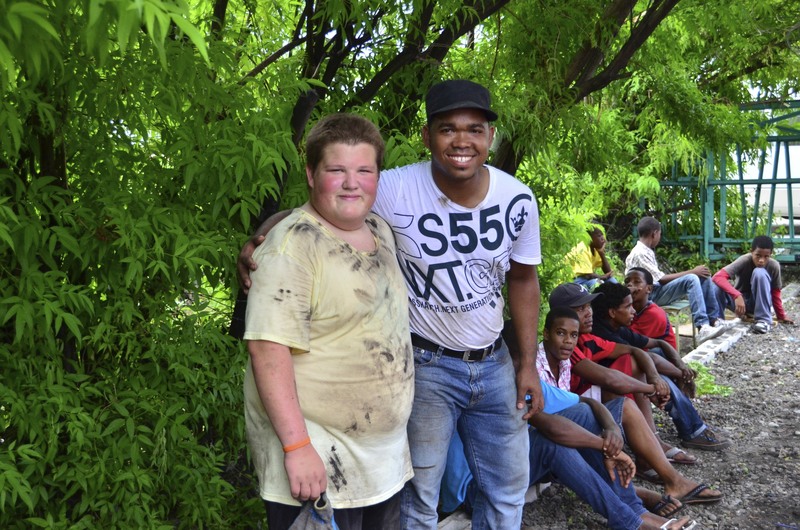 This past week in the Dominican Republic, I witnessed God working through our team in new and awesome ways. 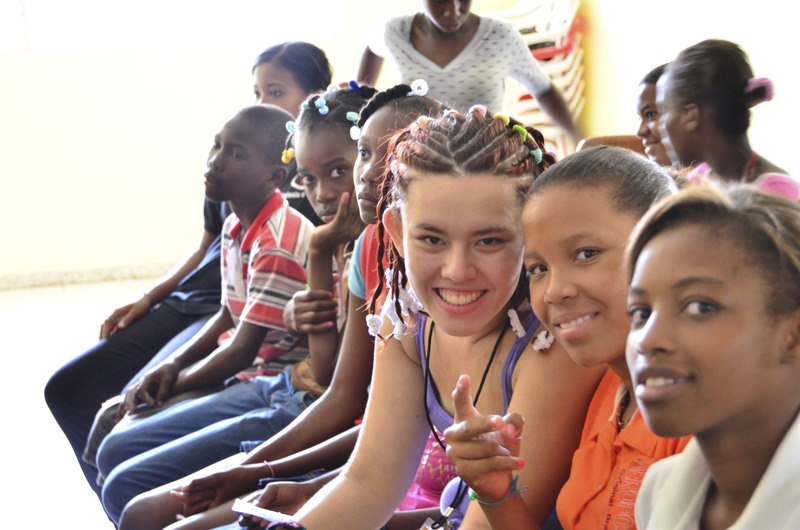 In particular was our time in Barahona as we took on an Extreme Makeover – Compassion Edition. 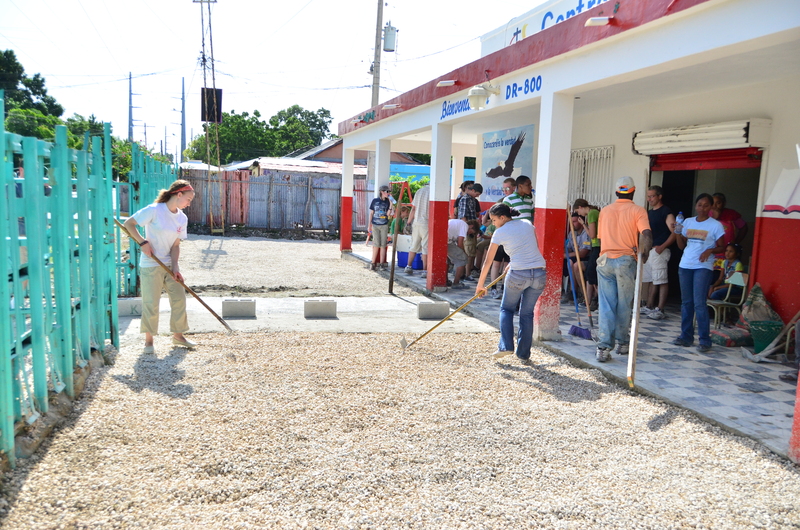 In just two day’s time, God used us to radically transform their project (we’d call it a community center here in the states). 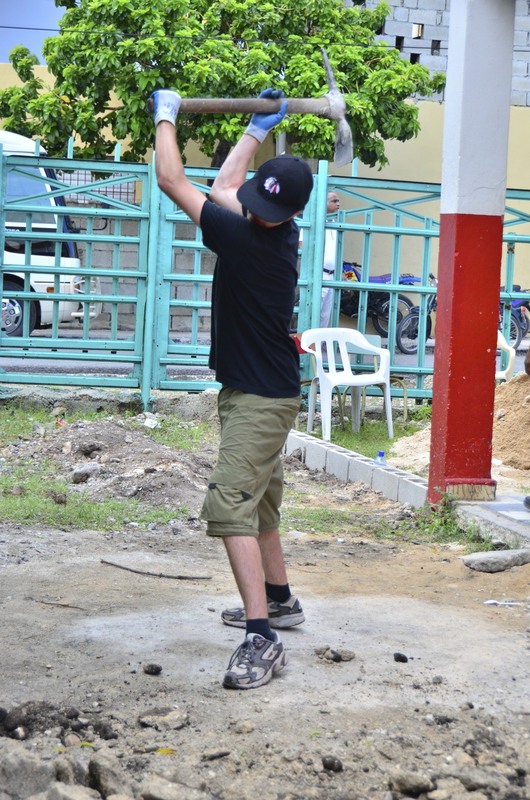 We chipped away cement and picked out big rocks to level the ground for a new basketball court. We removed playground equipment so that we could level the ground there and re-install the playground equipment with a new, safer layout. 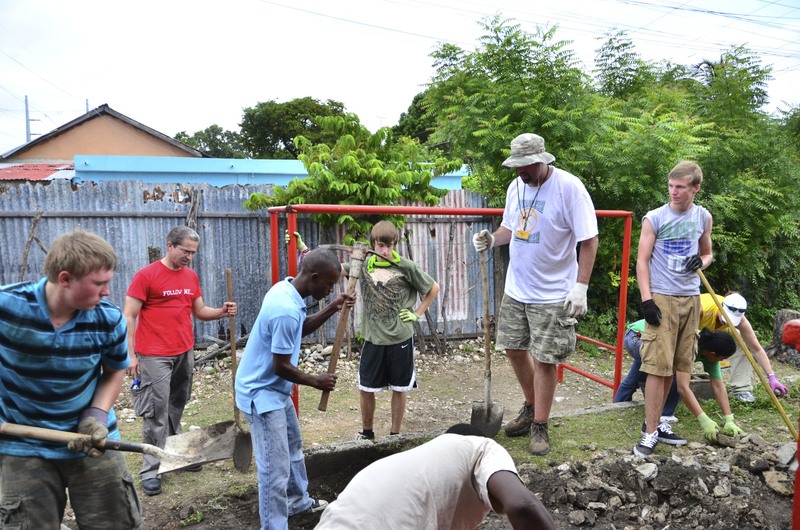 We dug out a small retaining wall that gave us the dirt necessary to level the basketball court. We helped mix and pour cement used for the basketball court, for reinstalling the playground equipment and to fix the pathway at the front entrance. 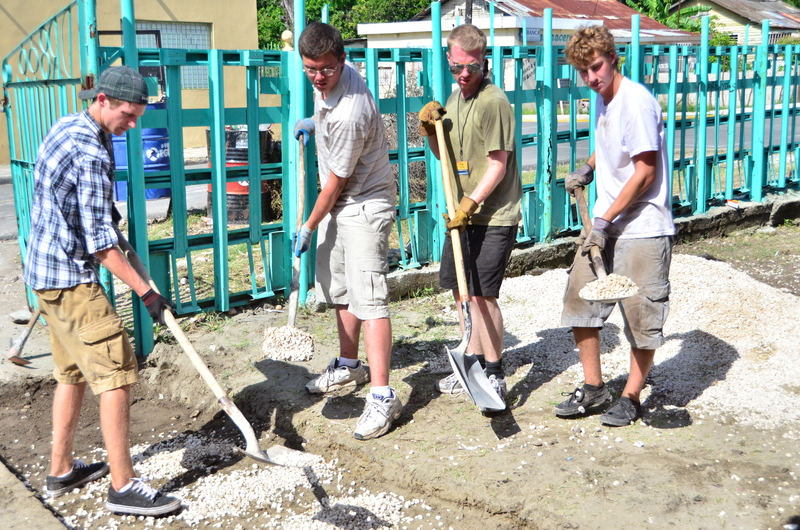 And we spread about 12 tons of white rock throughout the playground to help it looknice and to be safer for the children. 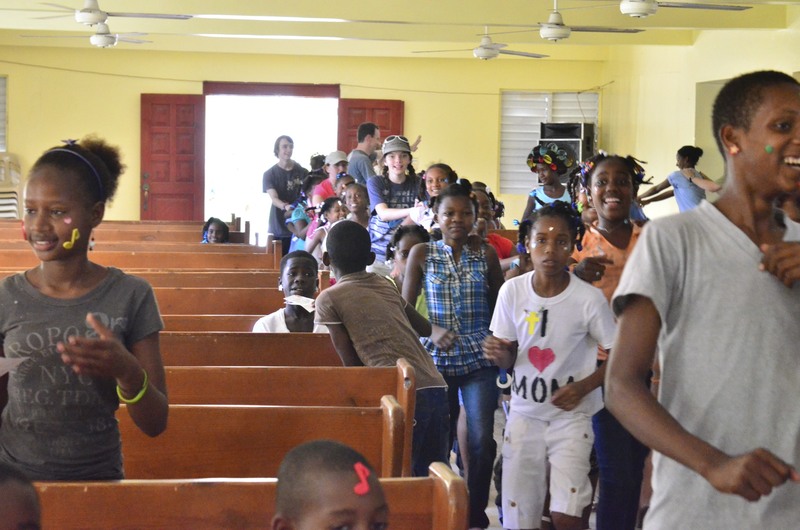 In addition, many of our team was also leading songs and games with the children over at the adjoining church. They were making bracelets with the wordless book and handing them out. They were putting stickers on faces and hands. We painted fingernails. And they were printing their pictures and giving them something to help them remember our time together. But it was the second day at this project that stood out to me the most. The second day was sunny and hot and we knew we had a LOT of work to do if we were to finish the job we started the day before. 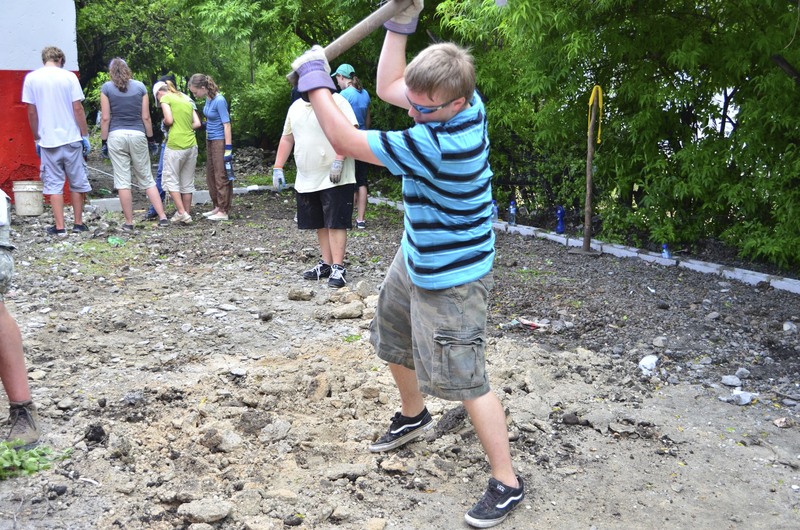 We had some more leveling to do, we were re-installing a teeter-totter, mixing and pouring cement for the basketball court, entrance and playground equipment and there was a lot of rock to spread. But our team came together like a well-oiled machine. 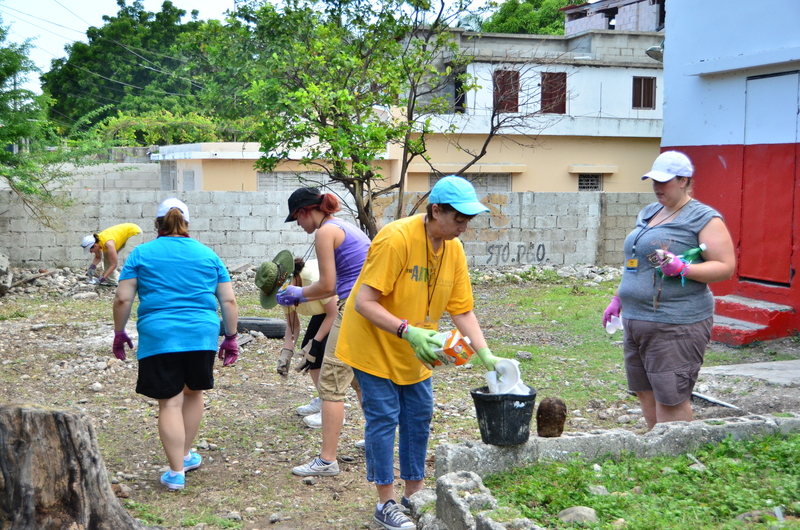 One group shoveled the rock into wheel-barrels, another group ran the wheel-barrels to the place it was needed most and dumped it, and then the team with rakes spread and smoothed the rock. On the other side of the project, we had some people mixing the cement, others shoveling the cement to wheel-barrels and others running the cement to the basketball court where it was dumped and smoothed. We had a vision! We had a game plan! We had people rotating in and out of the action so we all were rested and hydrated (well, almost all of us )! And we had God working through us to complete the good work he started in us the day before! The final job of the day was spreading the white rock. 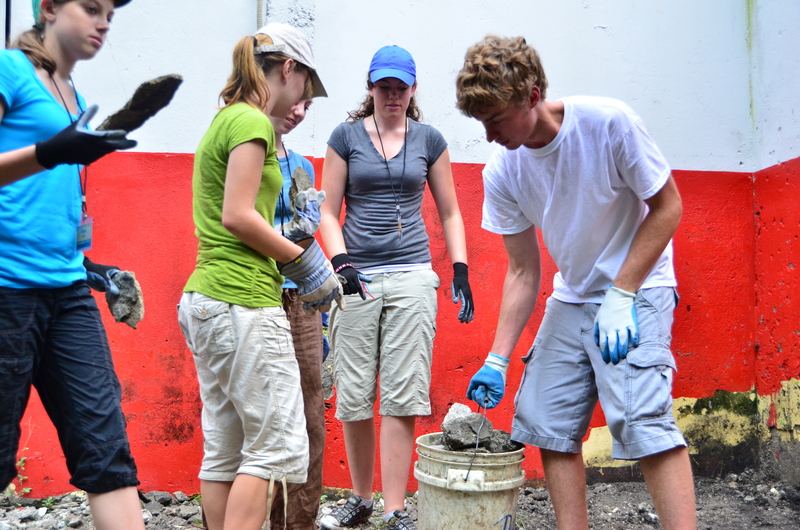 Working as a team, by God’s strength, it took us about 2 hours to spread the last 9 TONS of rock! It was amazing! When it was all done, every one of us was in awe! The place looked nothing like what we’d arrived to the previous morning! And all we could do was sit back and take in what the Lord had done through us, praising Him for the strength and energy! And there it was…that feeling…just like the national championship I’d been part of 13 years ago. The celebration of seeing the vision fulfilled through countless hours of preparation, commitment to the leaders and each other, hard work, and trusting that the job would get done no matter who was in the game because we all had a role to play. But there was just one mistake. In the midst of my days playing basketball, Coach Wilmore caught me making the same mistake. It came after my best game of my career. What was that mistake? I showed my potential – and now that I had given him a glimpse of my potential, my coach expected it from me every time I laced my shoes up and hit the floor. 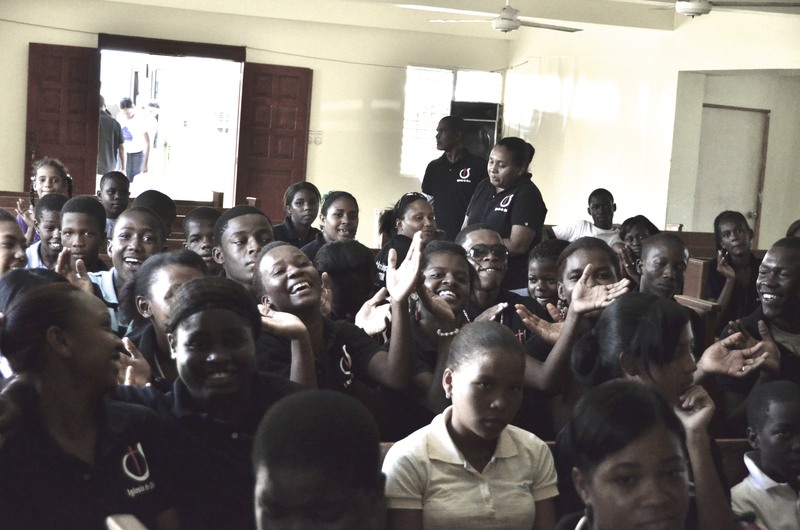 Our DR Team showed me their potential this week – every single member of our team…students, adults and myself included. We showed what we were capable of when we are willing to completely yield ourselves to God and let His spirit take over and move through us! In many ways, it was even better than winning a championship however many years ago because the results are blessing so many people and will last for years to come and will be celebrated in heaven forever! And as the youth pastor, I, like my coach before me, have the duty and honor to hold this team to their potential now that we are home! 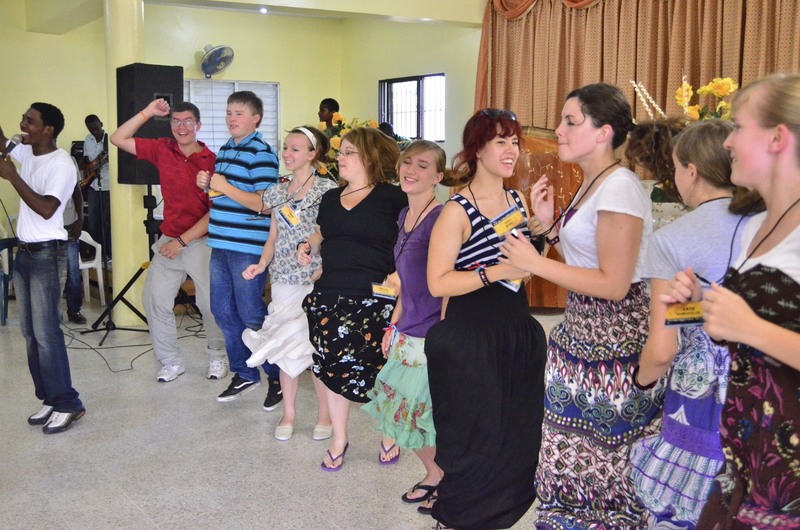 God is just as present and working in Vancouver as He is in Barahona! 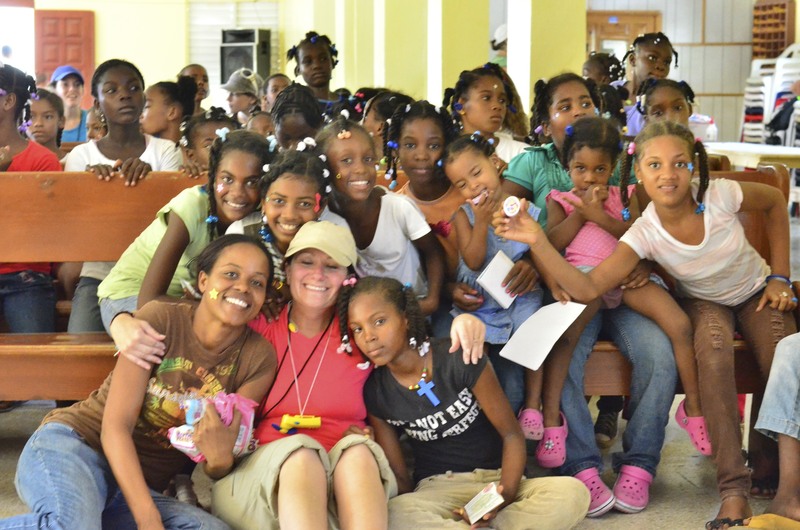 If we yield ourselves to the Spirit of God, there’s no reason we cannot transform hearts and lives for Jesus in our homes, our schools and our communities the way we did in the Dominican Republic! Pray with me to that end! How do you quickly explain to someone how your trip was? There are still so many things running through your head, so many faces, and so many names. And not everyone wants to get your emotional vomit all over them. But they still want to hear about your trip. So how do you explain it? and all sorts of crazy things. Then we were called in for closing songs before the kids went home. We went in and all of a sudden there was a little girl holding my hand. I looked down at her and smiled. She went with me everywhere. We had a huge conga line and she and I danced together. And she was around my waist the rest of the time. I kept looking down and every time I saw her she was looking up at me with a huge smile. She melted my heart. I don’t know why, but I love her. I never said a word to her. But I love her. It was simple and easy. I don’t know how to explain it. But I know that she loves me too. I know that that is how Christ’s love is for us. We don’t need to ever say a word to him, but he loves us all the same. He holds our hand, and dances with us, he looks at us and smiles, but most importantly he loves us. And that little girl Francesca showed me Christ. With just a smile. Oh, How He Loves Us…. I have been invited into the homes of 2 families. 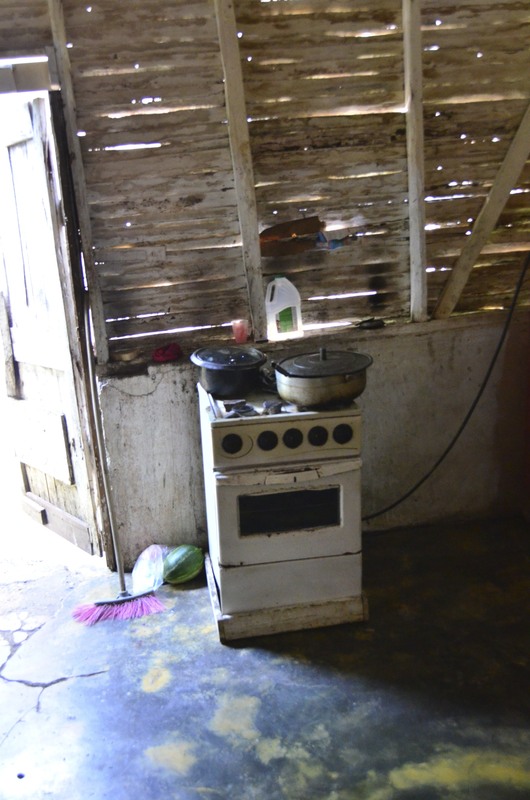 Both families live in a home made of tin and wood haphazardly nailed together to make a shelter. No bathrooms or running water and a small room that everyone shares with mattresses on the floor for a bedroom. However, when I entered these homes, these kind people pulled up chairs and welcomed us into their hearts and homes. The joy in their hearts and the hearts of gratitude put me to shame. When asking a man, ironically named “Jesus”, how we could pray for his family, all he asked for was that their kids would always put Christ first and stay close to Him. He never asked for anything for himself, nor did he ask for more money or material things. If that wasn’t convicting enough, he then asked how he could pray for me and added my name to his family’s prayer journal. He told me he would constantly pray for me. What an example of a Christian brother! Today, we worshiped and played with kids. 500 of them. 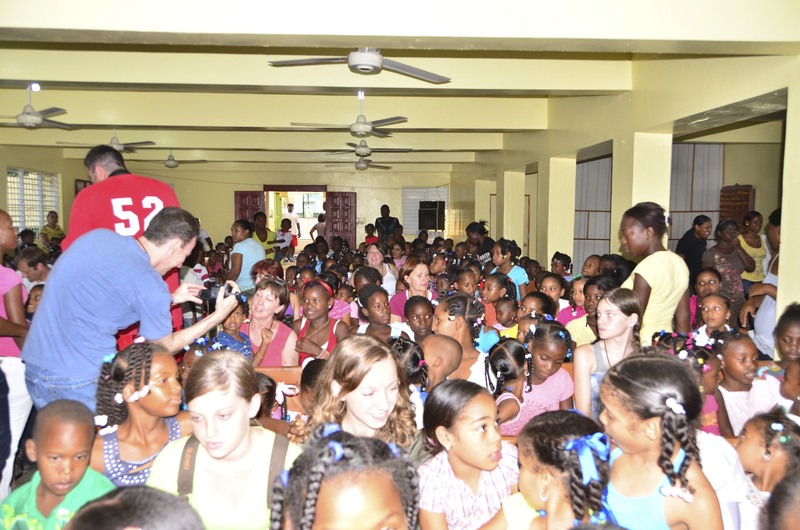 500 of the happiest children I have EVER seen! They sang songs about Jesus with reckless abandon and passion I haven’t witnessed in a long time. This from children who have nothing, yet showed me that actually they have everything. They showed me that I need to love like they do. I need to worship like they do. I need to focus on eternal pleasures and not temporary ones. I came on this trip to bless, but instead I have been blessed beyond my wildest dreams. I have also been blessed to serve and to watch others serve. I have been blessed watching the teens on our team love so well. I have watched them be the hands and feet of Jesus. I have watched them for 2 days do a project that involved lots of shoveling, pouring concrete, digging, spreading rock and cleaning, and all of that in 90 degree weather with 90% humidity. Not once have any of them complained. They have worked their hearts out and treated each other with dignity and respect and worked hard. Getting them to stop and take a break has been quite a challenge. I have watched the young men show honor to the young ladies on our team. Holding doors, letting them be first in line, standing up and giving them seats, and graciously allowing them to do the physical labor of our work project (those girls are amazing with a rake and a shovel!). I could write pages more. There’s so much more I’d like to share. I don’t suppose I’ll be able to wrap my brain around all that I have experienced until after I return home. I just know that the things I have seen and heard will not soon be forgotten. I also know after spending all this time with Compassion International, that I’ll never look at sponsorship the same either. 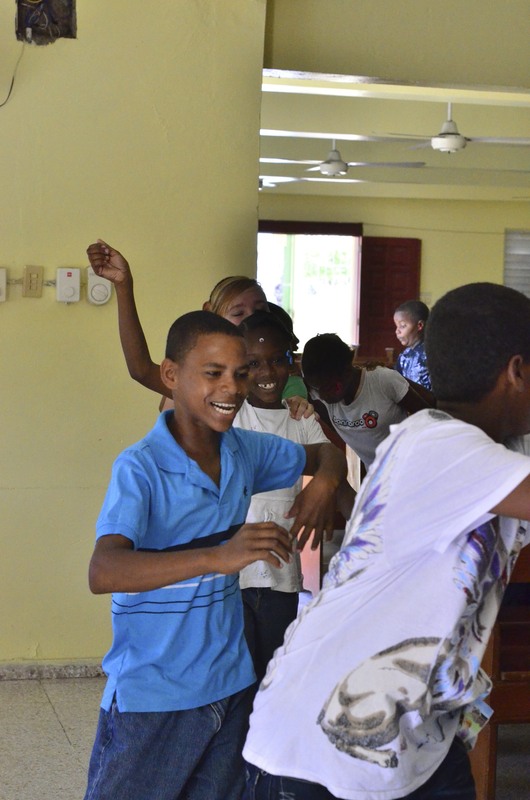 These last few days I have had the privilege to speak and serve with many Dominican children and adults. We touch them with the large gifts and services we bring, but I’m not sure they know just how much all the small things they do touch our hearts. I am so lucky that I am able to speak Spanish, because I am able to create deep relationships with a few children in a short amount of time. I want to share a few stories that really touched me even though the blessings may be considered small back in America. The first story is about a little girl that is named Yafreisy, who is 13 years old. We met when I spilled nail polish on her feet and hands! I felt so bad, but she said “Me gustaría hacer tu pelo luego” (I would like to do your hair later). I have no clue why she wanted to be around me after that, but I suppose she was just thankful that I took time to paint her nails. 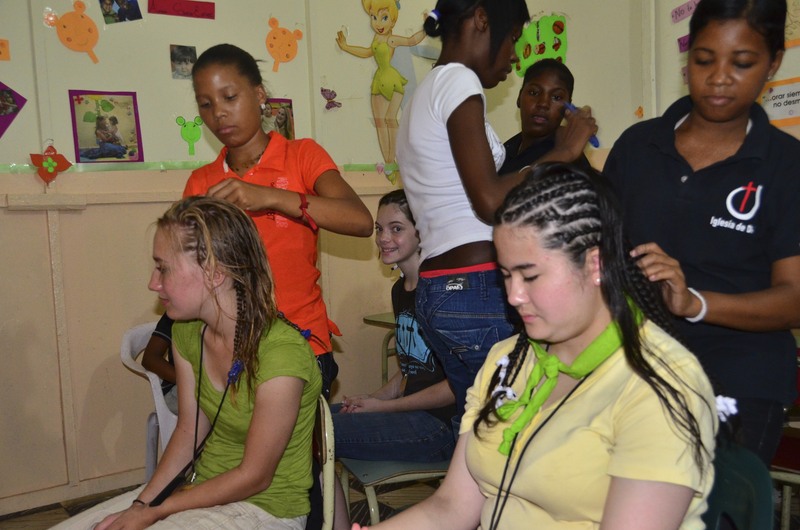 Later she helped me braid and twist my hair into an amazing work of art! She wanted me to come with her and help her with crafts and before we even started she grabbed my arm and put her bracelet on me. I could probably buy it for about 50 cents, but to her that bracelet is a special item and she still wanted me to have it. This is when I met her friend Alany. During crafts I met Alany, who is 12 years old. She loved my hair and the fact I could speak Spanish in order to help her complete the project. She followed me around, more like pulled me around, to things she wanted to show me and to people she wanted me to meet. It was a blessing to be with her throughout the day. She spoke a little English and I could speak some Spanish, so we tried to teach each other new words in both languages. She had to leave with Yafreisy and I wasn’t sure if I would see her again. But, the next day we were passing out shoes and I heard a girl outside the window calling to me; it was Alany. There was a mob outside, so they were worried about our safety and we weren’t able to go outside, but through all the chaos she wanted to give me her necklace that looked very expensive for a girl in poverty, yet she gave it to me without hesitation because she said “Te amo” (I love you). Earlier the second day I met a girl named Genesis. All I said to her was “Me gusta tu vestido” (I like your dress), and from then on she wouldn’t let go of me. She wanted to take me everywhere with her and she wanted to take pictures with me, but it was her birthday that day and I wanted to bless her in some way as well. So I told her “Nosotros podemos tomar una foto solo de tu para tu cumpleaños” (We can take a picture of only you for your birthday). She told me instead “yo quiero una foto contigo” (I want a photo with you). Later that evening when we returned to the project I saw her again and she helped me pass out shoes to all the children. After Alany gave me her necklace, Genesis gave her ring to me and said “Te quiero tenerlo para me recuerdas” (I want you to have it in order for you to remember me). She didn’t think twice about giving it to me and she told me not to leave, to stay, and that she loves me. All three girls were very hard to leave and they all are beautiful, have beautiful hearts, and beautiful personalities. It was hard to translate everything and respond in Spanish, but that was part of the challenge in order to build relationships with these wonderful girls. They all touched my heart with the all the little things that they gave to me, whether it was tangible or just a part of themselves. After every encounter with them I broke down and cried when they left because I didn’t want them to go and because they gave me such expensive gifts in their eyes. I worry about saving money for college, new shoes, and new clothes etc. that I don’t need to worry about, so it’s hard for me to just give away my things and my money because I feel like it’s valuable. These girls don’t have a lot and they need to save money for necessities, yet without even thinking they gave me wonderful gifts with complete joy. I am like the rich people to them and they taught me a wonderful lesson that I will have to bring back to the United States with me. I love those girls so much after only a couple days and I hope I was able to be a blessing to them just as much as they were to me. Dios se bendiga a Ustedes. During this trip I have met many new people. Made many new connections and many new friends. Some people I only have got to talk to for a couple minutes. To them I only have gotten to ask them how they are, what sports they play, what music they listen to and a few other simple questions. However the last few days I have gotten to know someone who I will never forget. On Monday I met a guy named Sandu while working at the church. We got to talk for a little bit and I learned that he is eighteen years old and that he played the piano. Before I could talk to him more though we had to leave for the night. The next morning we came back to work on the church some more and Sandu started to hang out with me and follow me around. He invited me to play bass with him while he played the piano and we had a jam session together. We talked about our lives and where we come from all the way up to lunch, which was for a couple of hours. Before I left for lunch I went and asked him his name again because I had forgotten it. I have heard many unique names this week and it is very hard to keep track of all them. Also I told him that I wanted him to write his name down in my journal at the going away party so that I would not forget him when I left. Tonight after dinner, we all loaded up onto the bus after dinner, and headed back to the church for our going away party. In the beginning we did some fun songs in Spanish with the kids. Then it was time for worship. Sandu played the piano during worship and he amazed me with his talent. The Dominicans then wanted Fallen Short to play a song for them. I got to play bass and our band played two songs for worship. After we were done he helped me put away the bass and then turned around to hand me something. It was a folded up piece of paper and I was very confused by it. Then he opened it up for me and what I saw just blew me away. 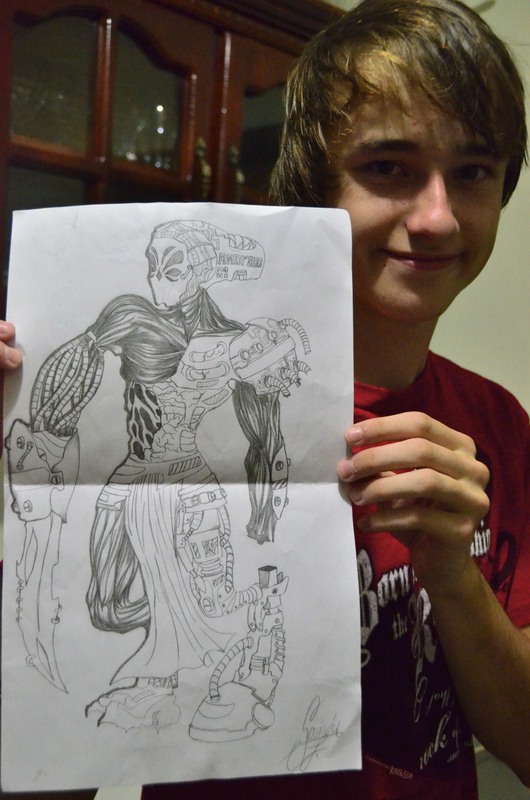 It was a magnificent drawing of an android type looking creature. The detail was fascinating and it was one of the best drawings I have ever seen. I told him thank you very much and had to go sit back down in my seat. That was not the end of our relationship though. Later that night one of our translators named Ben told me that Sandu had given me the drawing so that I would never forget him. It just really touched my heart and I could barely keep myself together. Immediately I looked around for him so that I could thank him again. I told him “Lo mantendré su dibujo para siempre” which means I will keep your drawing forever. I told that his love that he has shown me will be a testimony that I share will all of my family and all of my friends. I wish that I had a gift to give him in return but he said it was ok and that he didn’t want anything. I may have only known this amazing guy for two days, but I will never forget him because of his love that he showed me. I learned that friends can be made in a short time and that going the extra mile to show someone love will last forever. I would have remembered him for a while even if he didn’t give me his drawing but since he did, I will pray for him and think about him every time I see it. 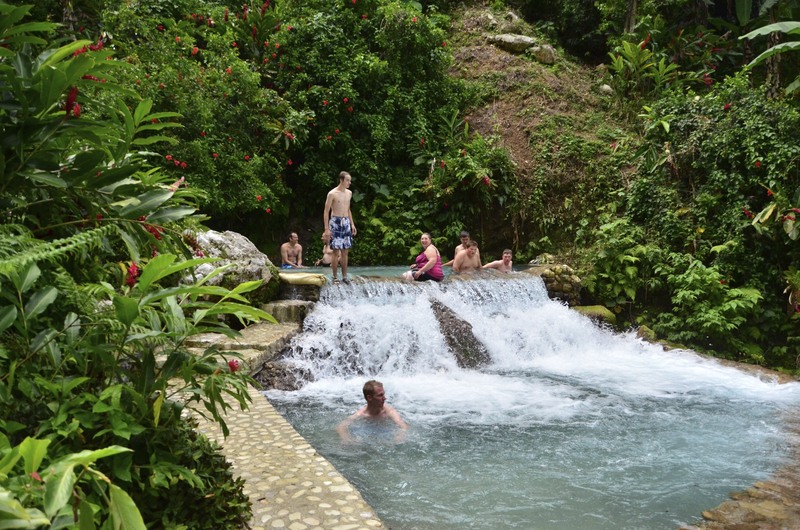 Tyler Rosu – This Trip has been really amazing! There are great churches, great families and amazing people but today was the best by far. Today I made a huge decision to go forth and sponsor a child through Compassion. God has really put it on my heart to sponsor a child. The way He has done that is about a year ago I did a youth group worship day and compassion was hosting a concert that we went to after this worship day. The concert they really pressed upon sponsorship and how it really would change the life of the child you’re sponsoring and the family around her. Then lets move back to what happened on the trip. 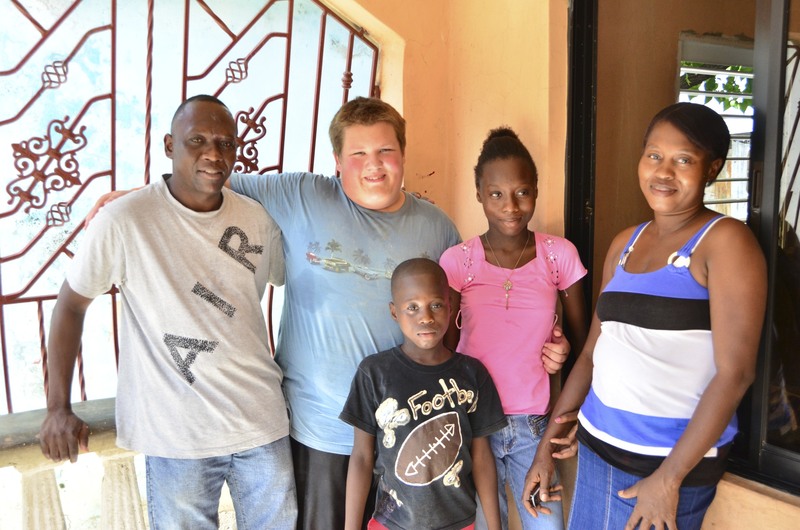 We have had home visits to see what the homes are like and connect to with the families and encourage them in the Lord or to follow the Lord. This really hit home with me because all the places we saw were bad but they really had hope. More hope then we would ever have in our lives. I also got to see how the families really changed and got affected by the Compassion projects and child sponsorship. Then, so I was kind of considering it when I got back home, but during debrief last night Steve Jones, (Dr. Jones as we call him now), he told us about a girl that could be sponsored in the area that we were serving. I felt like God was calling me out to do this. So I just jumped on it. Then, so today, they brought her down to the place we were working and building stuff. So I got to meet her today. 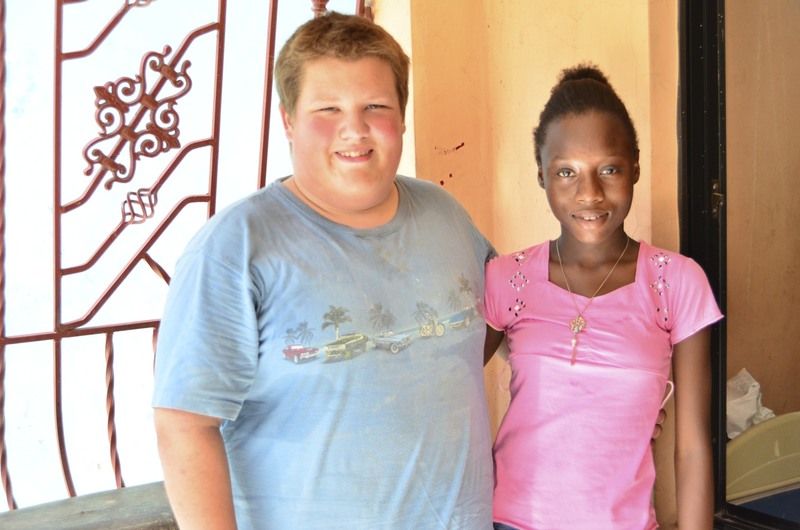 She didn’t know that she was coming down to be told that she was now sponsored and…going to meet her sponsor, which almost never happens to people that get sponsored. She has been waiting to get sponsored for 7 years and she is now 12, and her birthday is on Friday (The day we leave). I just knew the Lord set that up for a reason and to give that to her as a birthday present. I got to know her well and ask a bunch of question which was awesome. The best thing was that I got to go on a home visit to her house and see her house and meet her family and ask them questions. She is a beautiful little girl and has a beautiful family. 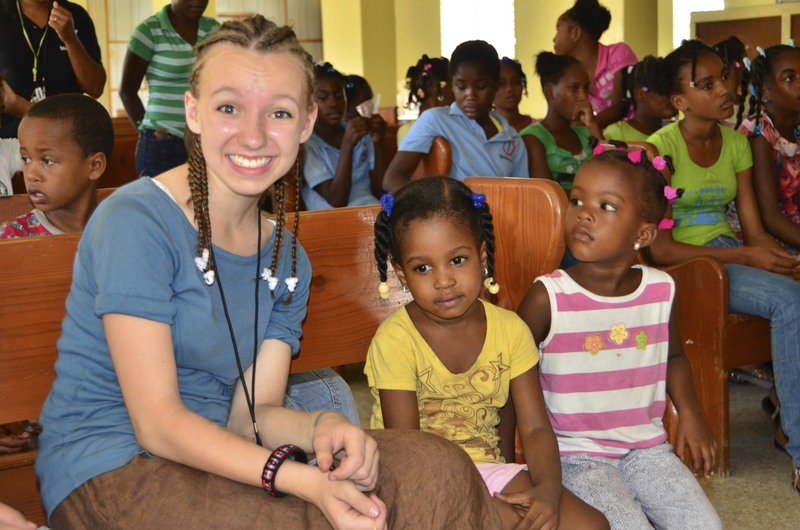 I knew that the Lord was calling me to sponsor her, and bless her and her family. 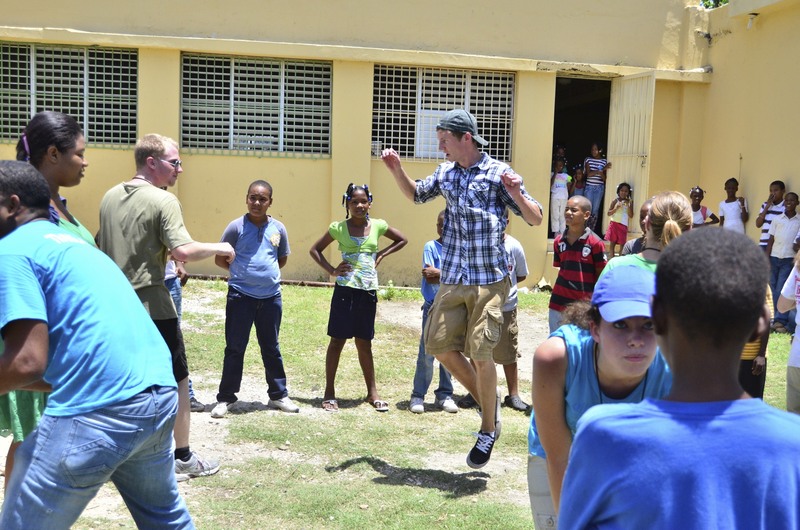 I rejoice in the Lord to do this and be a blessing all the way in the Dominican Republic. 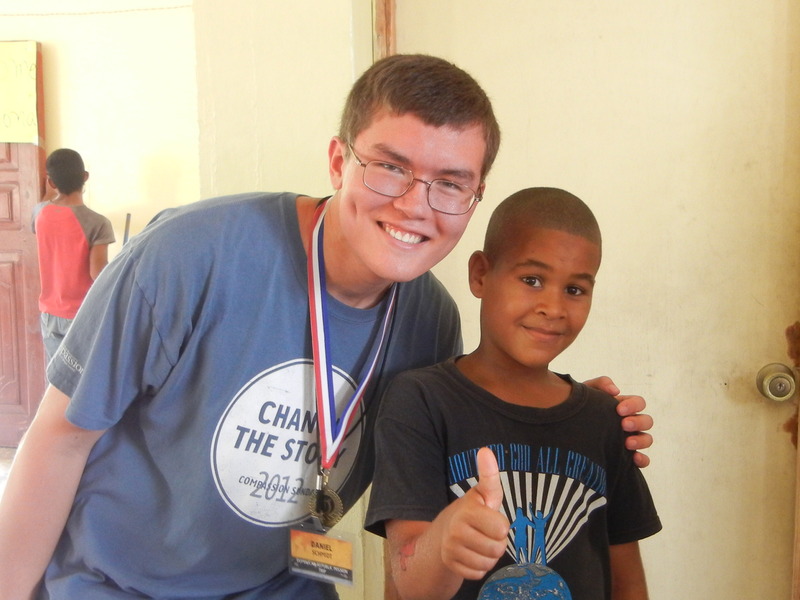 In just the first few days of being in the Dominican Republic, its truly impossible to imagine how crushed my expectations would have been had I came with any. Since Friday, leaving PDX and arriving in the DR, I’ve had the complete privilege and blessing to be able to visit two homes of families that live in the DR. Let me fully tell you, that no one truly knows poverty until they have experienced the way that they live, by being in their homes, talking to them, and trying to love them. Nothing can prepare you for the emotions that flood you, the feeling of the undeserved grace that you have been freely given through living in the States. My soul is completely burdened for these people, not entirely because of the fact that they live in such poor conditions, but because many of them truly have NO hope. We visited one home in particular where the mother had to give one of her children to another family due to not having the funds to support all 4 kids. She had no dreams, no hopes of the future, and was truly lost… living day to day. I ache to share with them that there is one who is so much greater, so much more worthy of praise, and that there is hope of eternal life in Jesus Christ! The glory of God blows my mind, he never forgets about His people, and He loves sinners. There is hope for the lost and for the broken… God has taught me that in crazy ways, even in the past 3 days, and i truly believe he will continue to. During our home visits, I realized what kind of situation many people live in. Their houses were no larger than a two car garage, there was no plumbing and limited appliances. We met a family with eight children, but only five were able to go to school. It really puts life in perspective. If I came on this trip with expectations, they have all been thoroughly washed away by now. Though I may have anticipated the scenery, I couldn’t have predicted the stories. In the past days our team has had the opportunity to go on home visits to remarkably cramped, humid homes the size of most people’s bathrooms. We talked openly with families about their struggles and dreams as they attempt to break the cycle of poverty. In the two homes I visited, I saw a stark contrast between a family who didn’t know God at all and a family passionate and zealous for Him. Both families were asked what their hopes were for the future, and neither asked for the expected material things like a nicer home or larger paycheck. In fact, the didn’t expect anything in particular. However, the family without God seemed to believe that they could never have anything; while the Christian family knew that they didn’t need to ask for anything because God would provide. God showed me the difference that hope makes for families with nothing to hope for,and the beauty of the plans He has for us. 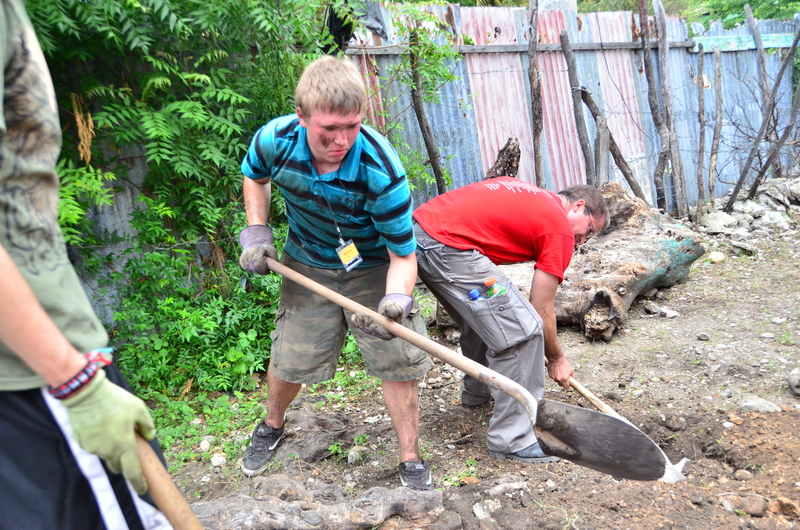 As people who do these trips often, we are blown away at how amazing these youth (and adults) are serving. Their humility and enthusiasm, their hearts and attitudes, exceed any and all expectations we had. God has been with us, and continues to guide this adventure in ways far beyond anything we could have planned. We are watching our youth become even bolder in their faith. We are seeing their hearts break for what breaks God’s heart. 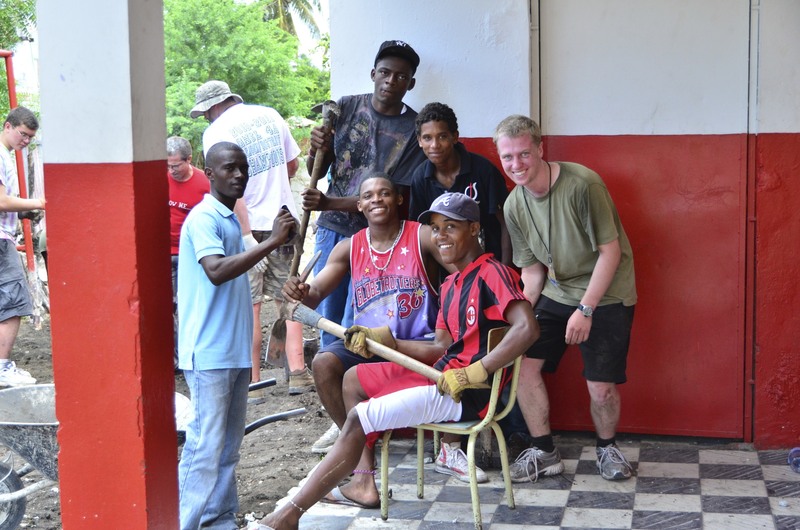 Today, as we began our EXTREME MAKE OVER on the church here in Barahona, it was such a blessing to see everyone pour themselves into serving. 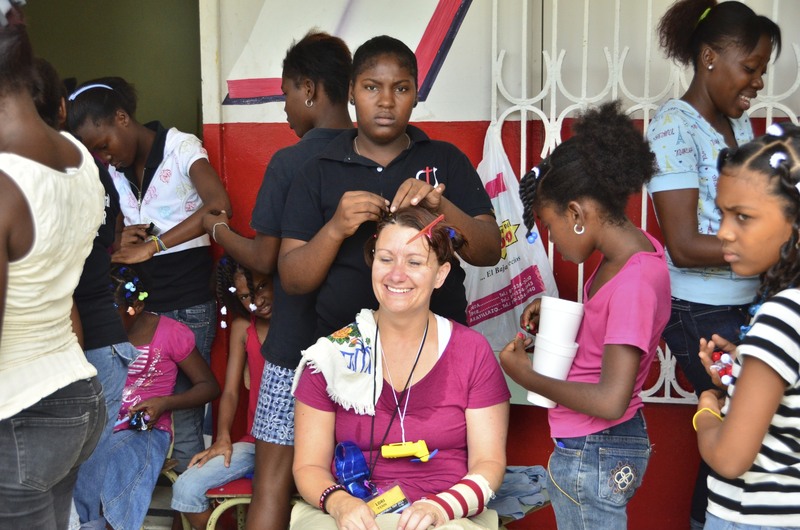 In the middle of it all, the children washed our ladies hair and braided it. Simply an act of love. 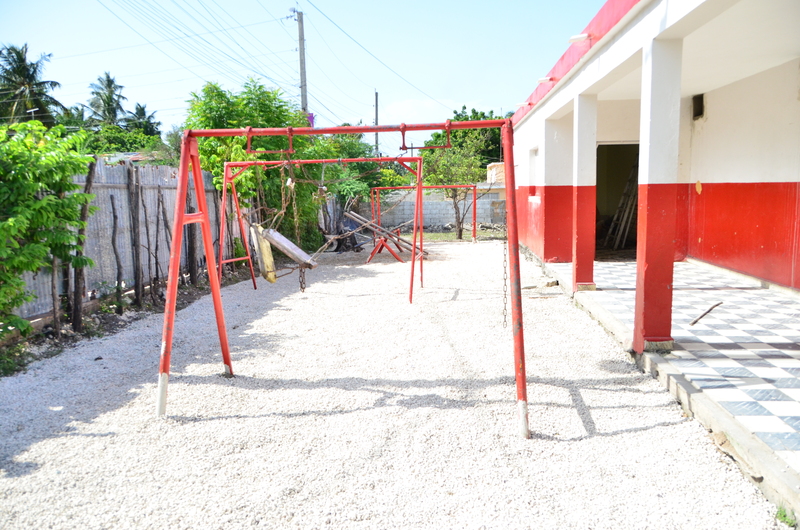 Our team worked incredibly hard as they prepared the way for a new basketball court and a new playground for the children. They have seen the neighborhood, the poverty, and the homes, and they have heard the stories of the orphans and widows, those that are hungry, those who have nothing but Christ. 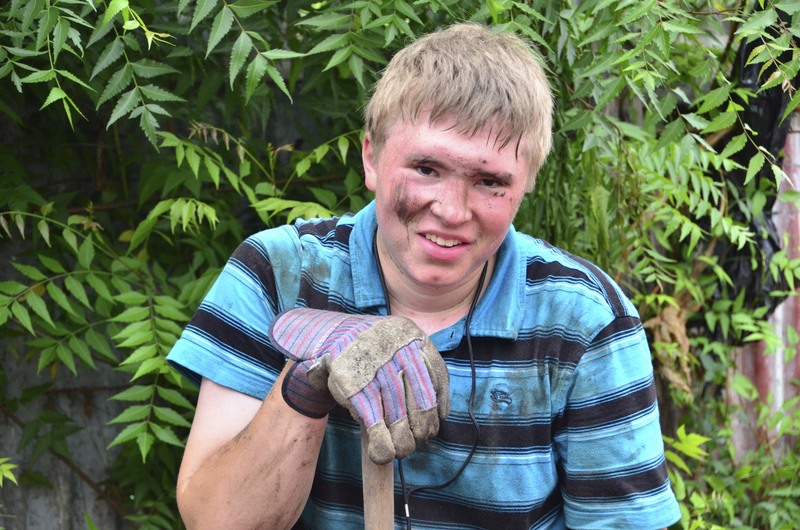 As they moved dirt, broke up cement, carried rocks, knocked down walls, and played with children, it was obvious that God has put a passion in our youth to serve in this place. Seeing the joy of the pastor and of the children for what is being done to this place, is worth every effort, every dime and drop of sweat. 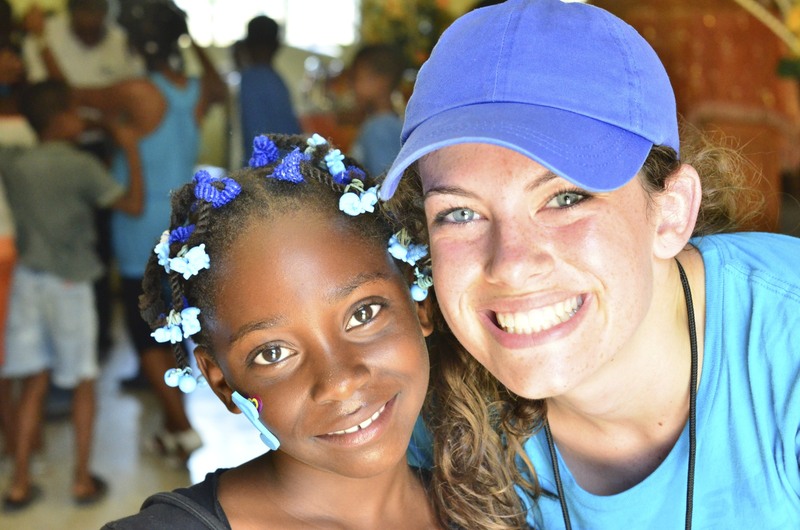 Seeing their smiles is a reminder to our team that Jesus truly loves us! We are so proud of this team! At the end of our day, the church surprised us with a gift by arranging for us to go to an amazing place to refresh ourselves. 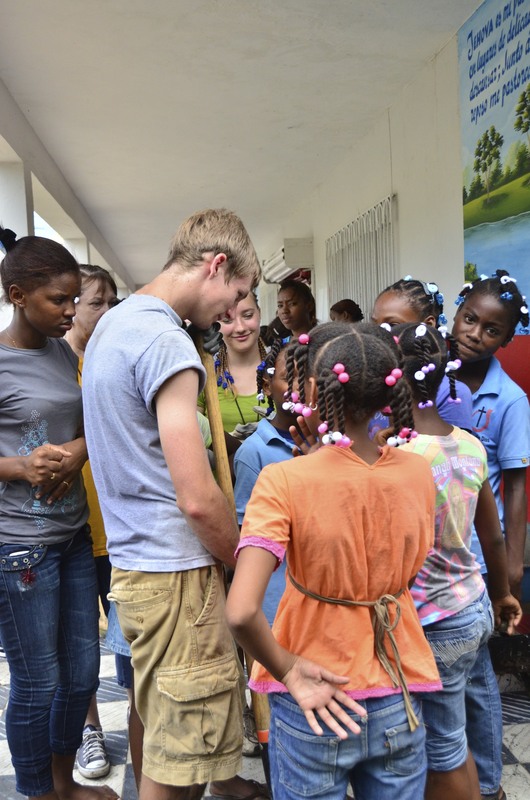 Please continue to pray for our team as we serve here in Barahona. We have a very big day planned for Tuesday with work, time with kids, 500 shoes to be fitted and a celebration in the evening with a worship service.